This canvas was personally signed by the most unstoppable Maple leaf of all time, Bobby "Boomer" Baun. 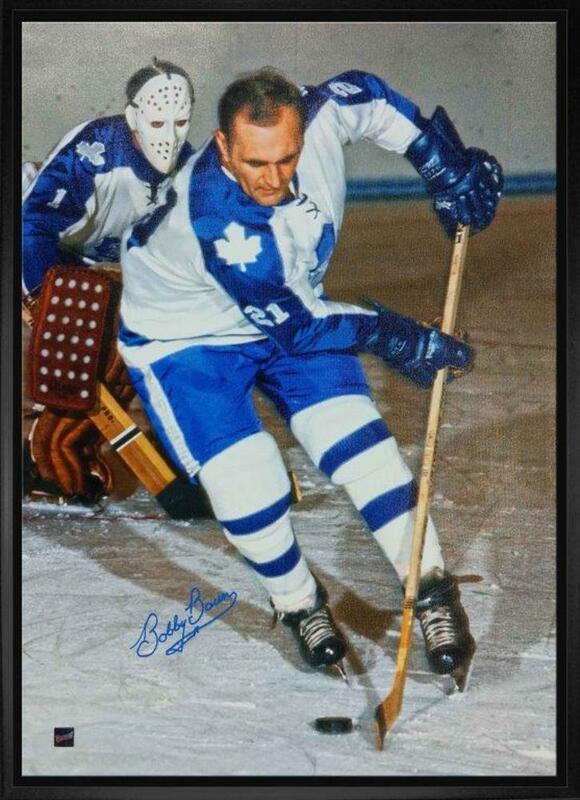 Bobby Baun is most well-known for scoring the winning goal for the Toronto Maple Leafs on a broken leg in game 6 to help secure a game 6 win and later to win their third consecutive Stanley Cup in 7 games. Baun was also known for being one of the cleanest, hard hitting defensemen in the NHL. Baun spent 17 years in the NHL predominantly for the Toronto Maple Leafs. Baun was the first captain for his lone season in Oakland with the Oakland Seals before going to Detroit the following season. The image has been printed on to high quality art canvas and is professionally stretched and mounted on the back of a 3/4" deep wooden frame. A Frameworth hologram and certificate of authenticity are included to ensure the legitimacy of the signature. Frameworth is an official licensee of the NHL & NHLPA. Frame Size: 22x31".